As medical science advances, people are living longer. But advanced age comes with a set of problems that require specialty equipment. One piece of durable medical equipment that is soaring in popularity is the rollator walker. It adds some great features to what we used to just call a walker. If you remember, yesterday’s walker was a simple device with four ‘legs’ and rubberized feet that was lightweight enough that someone who had trouble walking on their own could use it for extra ambulatory stability. Rollator walkers typically use wheels instead of feet so that the patient does not need to lift the walker as they move. And since weight is no longer an issue, makers are adding comfortable foam seats to the mix. If you get tired while walking, simply take a break and sit down. Most rollator walkers use a strap to make it easy to sit and rest without fear of falling backwards. Other features can include hand-operated brakes similar to what you’ll see on bicycles, and even collapsible storage bags to make it easier to transport helpful items. They come in virtually any color you could want. We set out to find the best rollator walkers with seats, and to review the ones with reasonably affordable prices and quality, safe construction. The current crop has excellent features and is great for that aging parent who needs some extra help getting around their home safely. 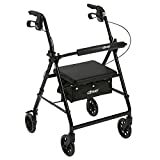 The Rollator with Folding Removable Back Support in black by Drive Medical comes standard with 6 caster wheels, loop locks and serrated brakes to ensure safety. The seamless padded seat opens to a roomy, convenient, zippered storage pouch to easily and securely transport personal items. The ergonomic handles are easy to grip, relieve hand pressure, and are height adjustable to accommodate users height. Drive Medical’s Nitro Euro Style Rollator is the ultimate mobility solution that marries advanced reliable features with a sophisticated exterior. The durable frame is made of lightweight aluminum so it’s easy to maneuver on any indoor/outdoor terrain, and strong enough to withstand extended daily use. To ensure maximum safety, the brake cable is built into the frame, enhancing the sleek appearance. The Nitro Euro Style Rollator has unrivalled folding capabilities: it easily collapses to an ultra-compact size with one hand by pulling the seat grip up and bringing the ergonomic, height-adjustable handles together so they almost touch. To further offer customized comfort, the removable back is also height-adjustable, and the luxury seat is made of easy-to-clean nylon. 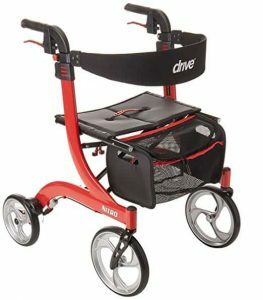 Enjoy the complimentary removable zippered storage bag for secure convenience of all your personal belongings whenever travelling with your new Drive Medical Nitro Euro Style Rollator. 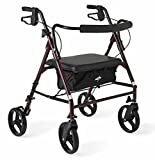 Large 10 inch front casters allow optimal steering and rolling comfort, Cross-brace design allows for side-to-side folding and added stability, Handsome and removable zippered storage bag with unique attachment to keep bag securely in place when Nitro is open or folded. The Medline Bariatric Rollator Walker features a durable steel frame and large 8″ wheels. This heavy-duty rolling walker is ideal for persons with health and rehab conditions. It features height adjustable handles and greater distance between the handles for seniors and people that need or want the extra room. Built for comfort, the medical walker has a padded seat and back support, so you can sit and rest in comfort after walking. The foldable design makes it super easy to store away when not in use.